Sell old cell phones as quickly as possible before they lose more market value. Those used cell phones in your drawers have value! Send in your old cell phone today. In the United States, the average cell phone user changes his or her cell phone to a newer model every 18 months. If you're like most people, chances are, there's a used phone or two stashed away in a drawer in your house. So, what do you do with this clutter of old unwanted mobile phones? The simple solution: sell old cell phones. Pacebutler Corporation, the premier buyer of used cellular phones in the United States, will pay as much as $300 for each of those phones, depending on the quality and model of your unit. Nothing can be easier and more convenient than selling your old cell phones to Pacebutler Corporation. The transaction is done online and will only take a few minutes of your time. The steps are quite simple: check the Purchase Price List page on this site to find out the actual value of your old mobile phone, print out the mailing label, and ship your old cellular phones to us - for free. Your check is usually issued within 2 business days after we received your phones. You have the option to use either the FedEx mailing label or that of the US Postal Service - you can actually ship your old phones right from the convenience of your home! So, how much are you getting for your phones? As mentioned above, it depends on the quality, model, and brand of your unit. When you sell old cell phones to Pacebutler Corporation, we always encourage you to check the Purchase Price List page prior to mailing your phones to us. This is for you to have a clear idea of how much those used cell phones are actually worth. Obviously the older and less sophisticated models are worth much less than newer and more advanced 3G dataphones. You're actually losing money by keeping those used phones in your drawer - the older they get, the less valuable they become. Used cell phones, when disposed of improperly in landfills, can pose a serious threat to our health and to the environment. Dangerous chemicals and heavy metals found in cell phone batteries and casing, like mercury, cadmium, arsenic, etc., can potentially contaminate the surrounding soil in landfills and nearby water systems. When you sell old cell phones to Pacebutler Corporation, you can be sure that your mobile phones are either reused or recycled properly, and not dumped in some landfill somewhere. 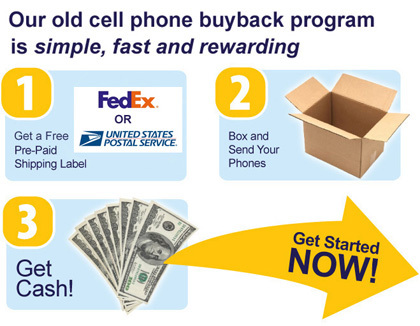 Could you ever imagine that you can sell your old cell phone and get money back from doing that? Now you can be assured that you can indeed go ahead and get cash back from this. This way you can get rid of a lot of clutter at home containing old gadgets or cell phones. Pacebutler.com can come to your rescue when you send us your old cell phones. After getting free prepaid Fedex labels, put your cell phones in the package and drop it off to a nearby Fedex facility. That is all and you are all set for receiving hard cash for your old cell phonesï¿½it is that simple and hassle-free. Remember that Pacebutler makes sure that we recycle or reuse your old cell phones in the most efficient way possible so that we protect our environment and our future. We recycle these phones which you send over to us which otherwise would have landed up in public landfills and would further contaminate the environment. Apart from this, we donate them and use the proceeds for various charity organizations. As a cell phone recycling company, we stand firm on our commitment to all our customers and the charitable organizations we work with. We have been here for 32 long years and can assure you of our commitment to our customers and all the charitable organizations we work with. Why not sell your old cell phone today itselfï¿½and put it to good use? "I have used PaceButler for buying back my used phones three times now. I was emailed, called and informed as to the status of my shipments and payments. I will continue to use PaceButler when I need to recycle my phones. Checks are received quickly and the follow up is terrific. They even take the time to call to make sure you received your check. They are a pleasure to work with and the process is simple."